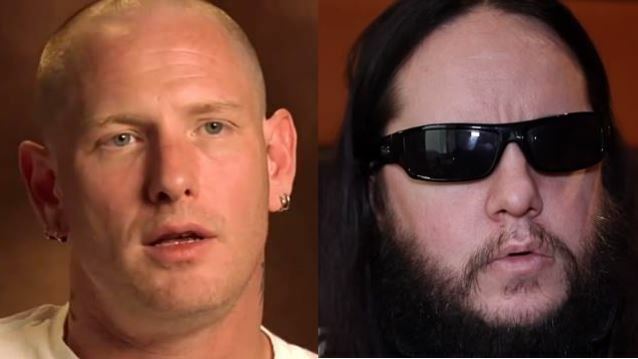 SLIPKNOT singer Corey Taylor has once again denied that the band's track "The Negative One" was written about the group's former drummer, Joey Jordison, claiming that the song's lyrics deal with the conflicting emotions of grief and anger that he felt right after the death of SLIPKNOT's original bassist Paul Gray. With lyrics like "The Lord Of Lies / You Had To Be Set Free / Opposing Sides / Your Choices Are The Negative One And Me," fans have speculated that "The Negative One" was written about Jordison, who was assigned "1" as his numbered alias shortly after the band's formation. However, Taylor has dismissed those theories as "incorrect," telling Loudwire (see video below): "I think there's a handful of people who have original ideas, and then there are millions of people who will pick up that original idea and just copy and paste it and put it all over the place. A lot of people aren't brave enough to have their own opinion. So even though that opinion was incorrect, I could see how something like that could snowball and really roll downhill and just start picking up people and getting louder and louder and louder. And, honestly, it wasn't until I came out and said something that people started looking at it in a different light. And, honestly, I didn't even realize that you could have read it that way. It was the furthest thing [from] my mind, because none of the songs on [the latest SLIPKNOT album, '.5: The Gray Chapter'] are about Joey. All of the songs on there are about the band in general — sometimes about myself, but also sometimes about just what we were going through when it came to Paul and his death." According to Corey, "The Negative One" songtitle is a reference to "the negative one and me — those two people. Fighting those sides of yourself where… There's a part of you that just really misses your friend, and then there's a part of you that is so mad at your friend that it makes it hard for you to feel empathy, which is very natural, especially when you lose someone the way we lost Paul. So it's dealing with very human issues, but it can go either way: it can go negative, it can go positive." He continued: "I can see where people would make that [association between 'the negative one' and Joey], but it's incorrect." SLIPKNOT announced in December 2013 that it had parted ways with Jordison, one of the band's founding members and key songwriters. Taylor told Metal Hammer that firing Jordison after 18 years was "one of the hardest decisions" the group ever made, adding that Jordison is "in a place in his life" which is "not where we are." Taylor said that the band is "happy right now and we hope that he is . . . he's just in a place in his life, right now, that's not where we are."